Children’s books take no time at all to write. They are easy peasy. You can write a children’s book by accidentally brushing up against your computer in your lunch break. Because your children think the story you wrote is hilarious – EVERYONE will love it. Don’t bother listening to those pesky publishers and agents – what do they know? Once you’ve written your story – sit back, relax and watch your bank account fill up. 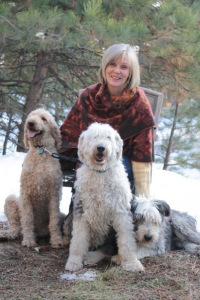 Here what it’s really like to write a children’s book. Your idea might come in a F L A S H – but getting it down onto paper and working in the right format can take a lot longer. More work goes into making a children’s book then you would imagine. This entry was posted in Uncategorized on April 30, 2015 by Rowena. There was a story in a local paper several months ago about a dog who was hiking in the backcountry when his master was injured in a terrible freak fall and died. When the hiker didn’t show up, people went out looking for him and found the loyal dog lying next to the body refusing to leave. Was the dog mourning the loss of his master? Some people thought so. This post is a bit more mystic, in that it covers a singular aspect of why people sail. This is not so much for power boats. I’ve heard it said (and it rings true for me) that folks who go on powerboats go with the intent of going somewhere or doing something in particular, whether it’s fishing or trawling or skiing. Sailors go with the intent of enjoying the going, not the getting somewhere. I believe that feeling is the edge of wanderlust, the simple desire to move. The first time I can remember feeling wanderlust was as a five year old child, watching the television show ‘Adventures in Paradise.’ The waving palm trees, the schooner Tiki, and the adventures of Captain Troy were all I needed to light the spark. As I approach the second last letter of the alphabet and the Blogging A-Z April Challenge is almost over, today’s post is not about me. It’s about YOU!!! This empty screen is a mirror seeking your reflection. I could slack off and ask each of you to introduce yourselves and your blogs but seeing this is part of a blogging challenge, I’d better make an effort. 1) What is your name/blogging profile? 2) What is the name of your blog & provide URL. 3) Which country do you live in and feel free to mention town and perhaps something about where you live if you like. 4) What are you writing about at the moment? 5) If you’ve been doing the Blogging A-Z April Challenge, did you have a theme? 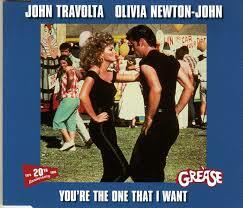 6) If you could meet any living person, or animal, in the world, who would it be and why? Add your responses as comments and I’ll compile them and do another post in a few days i.e. after the challenge. I have quite a few things on hold at the moment until “after the challenge”!! 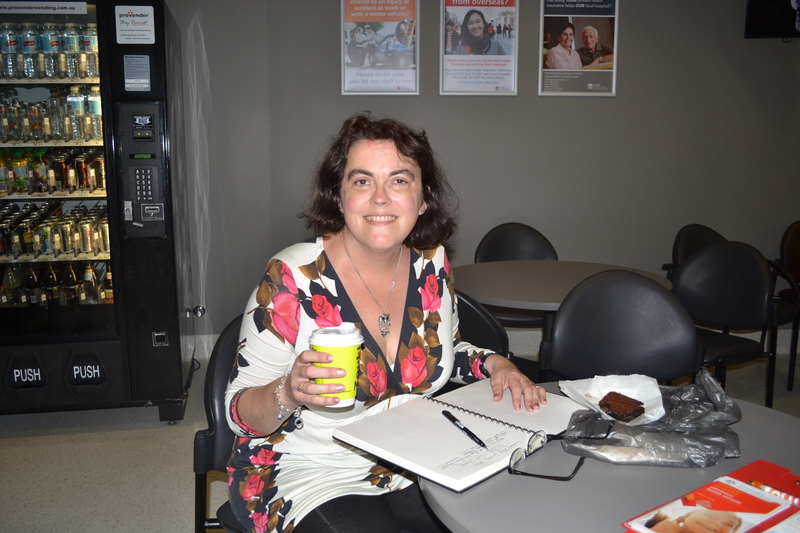 I look forward to hearing from you and getting to know you better…and for you to get to know each other better as well.I really work hard to keep Beyond the Flow personal and feel like we’re all sitting around in a fabulous cafe sharing coffee and chocolate cake together. To quote the hit musical Oliver, I hope you all consider yourselves “at home”. Michael Jackson – The Way You Make Me Feel. Queen –We Will Rock You. Bruno Mars – Just the way You are. I look forward to meeting you and turning this into a real online gathering. You’re all invite to join us! This has been “You” for the letter Y in the Blogging A-Z April Challenge. This entry was posted in Blogging From A-Z April Challenge and tagged Blog Share, blogger, blogging, Blogging A-Z April Challenge, community, CSI, fingerprints, friendship, identity, individual, Who are you, writing, you, You're the One That I Want on April 29, 2015 by Rowena. If you were in a crowded room and you had to pick the person into xtreme sports, you’d never choose this wobbly woman with the walking stick but perhaps it’s my broken wings which turns even a humble walk into an agonising fall, resulting in an X-ray and a broken foot. Being more at home in a cafe with my cappuccino and chocolate cake swimming in luscious sauce than bungy jumping or climbing Mt Everest in anything other than the metaphorical sense, I was plucked out of my chocolate sauce and landed smack bang in an adventure camp, with Muscular Dystrophy NSW in 2012. This was the beginning of the end. 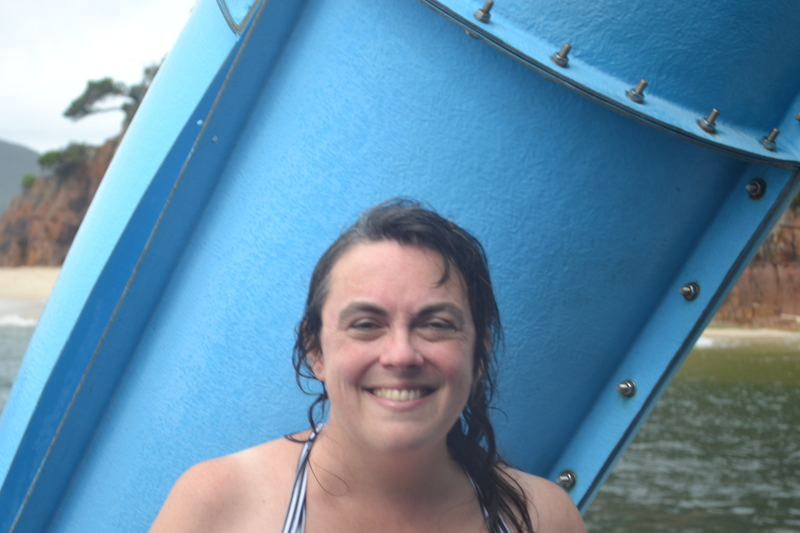 I went down this water slide twice, after almost blowing my brains out the first time down when water blasted up my nose. For me, even being away from the known and predictable at home with my mobility issues wasn’t easy but being with people who knew and understood my limitations provided me with the safety net to launch myself way beyond my comfort zone and take on what really were xtreme challenges and yet, it just felt like going with the flow at the time. 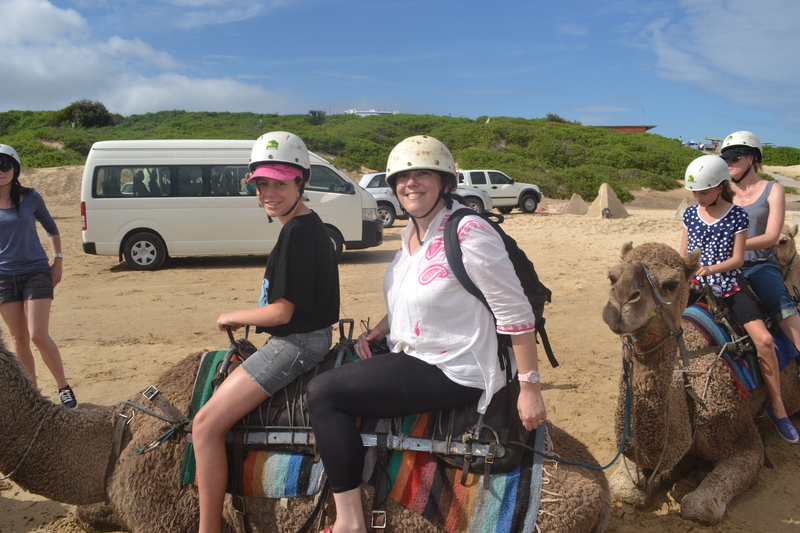 Camel Riding. This was more challenging than expected. This confidence was greatly aided, too, by the unofficial MDNSW Mantra “find a way”. Just because your disability or chronic health condition might prevent you from participating in an activity in a conventional way, it doesn’t mean it’s impossible. 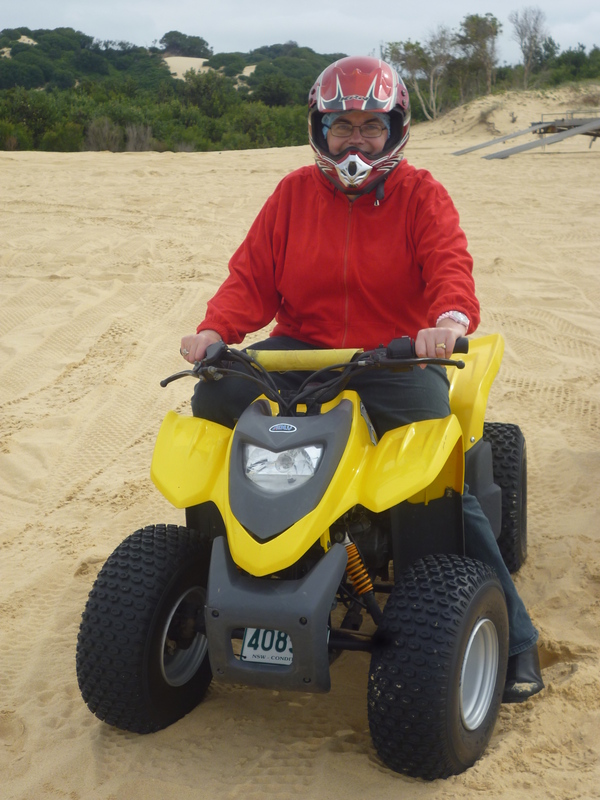 Here I am riding the quad bike. Of all the activities, this one took me most out of my comfort zone. 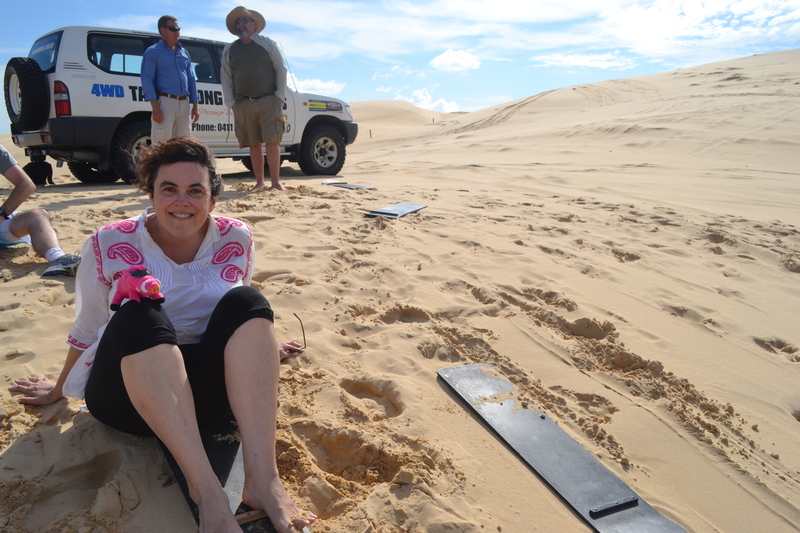 Trying out the quicksand. It felt really weird gripping onto my leg and it took a bit of assistance to get out. 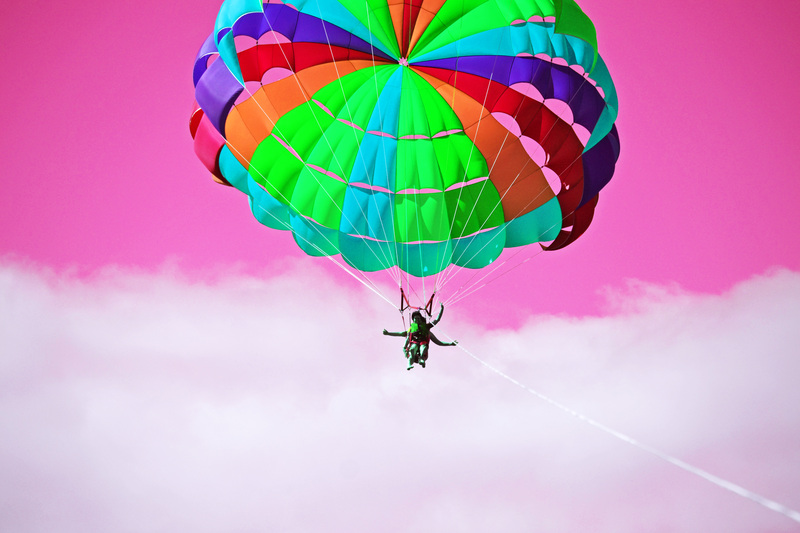 Going parasailing changed the colour of my day. It’s the closest I’ve ever come to feeling as free as a bird. 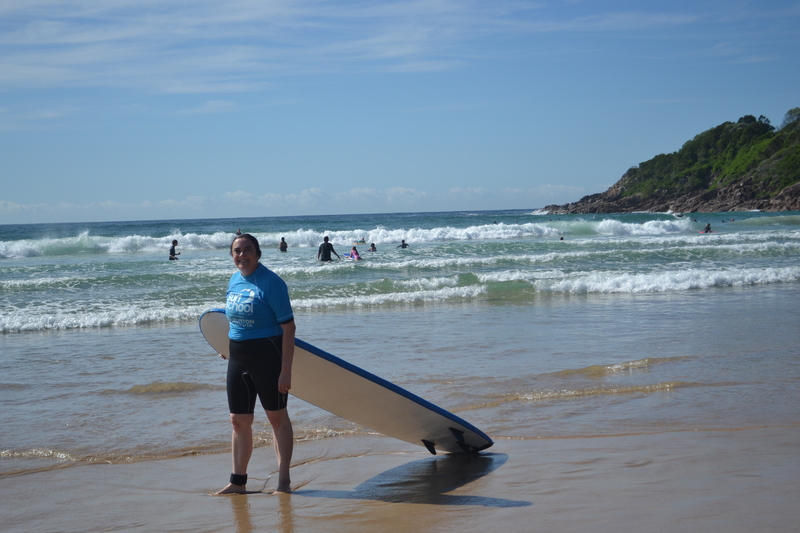 A year later, I did a second adventure camp and this time, I was thrilled to have a go at surfing. This was quite a big deal riddled with challenges before you even considered trying to stand up. There was finding a wet suit big enough to fit and then managing to squeeze into it, which isn’t easy when you have muscle weakness. Then, there was carrying my board down to the beach. Actually, I did get assistance and later ended up being able to drag the thing along the beach. Not very cool but I was stoked!! Although I didn’t get anywhere near standing up, I did manage to start in a kneeling position. That was as good as it got but I was certainly living the dream!! Not so cool…lugging my surfboard. 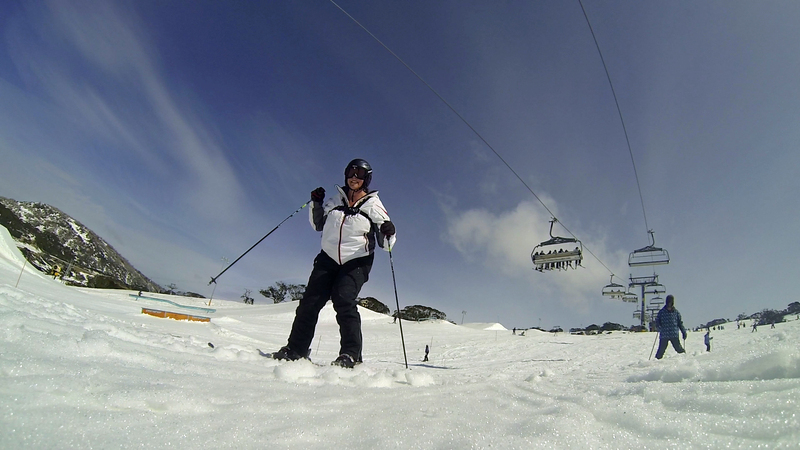 From here my next big leap into the wild world of xtreme sports was skiing. This was where I was really taking myself way beyond my comfort zone!! There I was perched at the top of the Village 8, peering over the edge of what felt like an almighty precipice…a sheer cliff dropping down, down, down towards Perisher village, which looked like more than hundreds and thousands sprinkled on buttered bread. If I was ever swallowed up by my own fear, this was it and instead of gliding smoothly down the slopes, I soon fell over. Was gasping for breath. Indeed, I was consumed by pure panic. I mean just because you’re doing an xtreme sports that doesn’t mean you’re not afraid. It means you’re brave, courageous…or perhaps just a fool going where angels fear to tread. 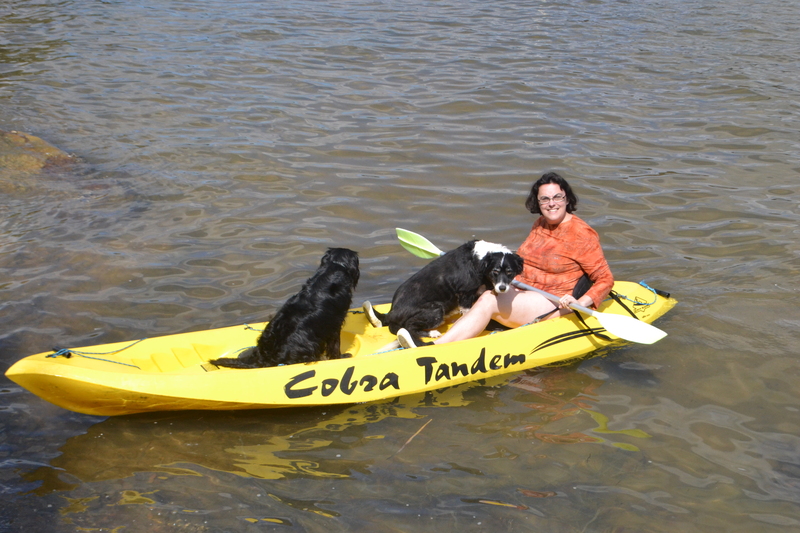 You try wielding a paddle with a great big Border Collie in your face! Geoff said Bilbo was actually lying across him when he took Bilbo out. However, there is another side to all these incredible achievements. You see, although I’ve been able to pull these off against all sorts of odds, I have struggled and indeed failed at times to manage the simple, every day stuff. Indeed, since I had chemo for 7 sessions over Christmas 2013-2014, my sense of time has been completely wiped out. I have no idea and now manage with the help of routines plastered on cupboard doors, alarm clocks, buzzers and indeed, multiple screw ups. It completely dumbfounds me how I can achieve the extraordinary and yet completely fail the ordinary. However, it’s unsolvable questions like this which ultimately fuel my writing and keep me off the streets. This entry was posted in Blogging From A-Z April Challenge and tagged A-Z Challenge, adventure, chemotherapy, chronic illness, extreme sports, holidays, journey, kayaking, Muscular Dystrophy, parasailing, skiing, surfing, travel on April 29, 2015 by Rowena. 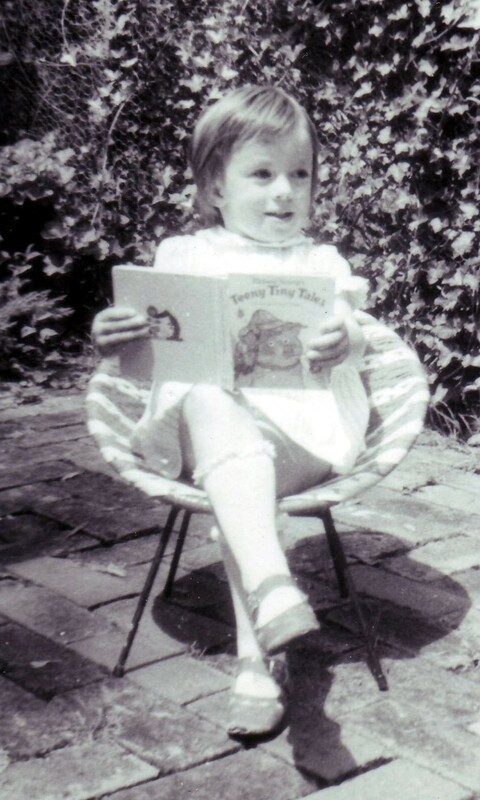 Here I am reading at about age 5 or 6…good preparation for becoming a writer. While plagued with writer’s block or struggling to rub two coins together, we really do have to wonder why we do it to ourselves. Why don’t we just go and get a real job? Yet, when things are going well and we are in the zone and each and every one of our senses is fully activated and alive and the most amazing stuff just flows onto the page and we actually resolve some of those inner conundrums and make real progress then we know. We know why we put ourselves through it. 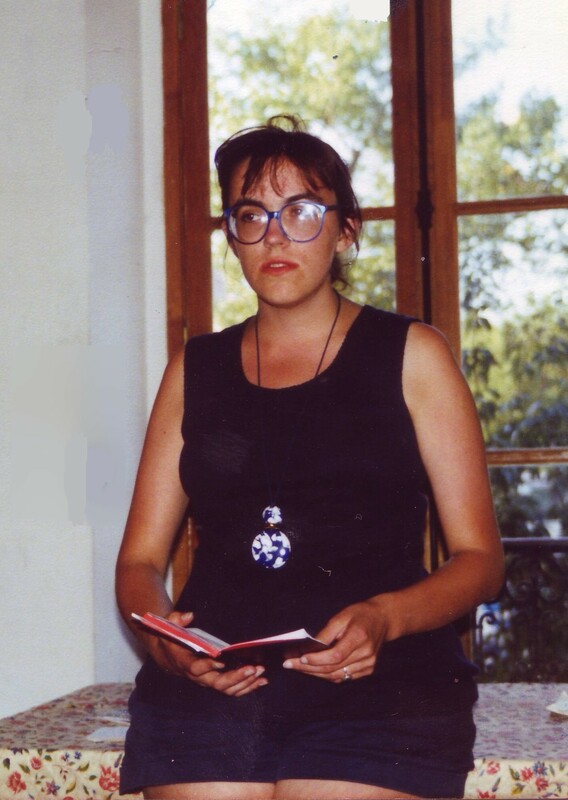 Reciting my poetry at the Shakespeare Bookshop in Paris in July, 1992. I had a little black book with my poems in. There is no more thrilling adventure than the creative journey. Whether it is expressed in words, paint, photography, fabric etc; the creative journey is incredibly thrilling and stretches our imagination, knowledge and often even our physical body beyond what we ever thought possible. It is pure electricity. Writing poetry at the Hotel Henri IV, Paris July 1992. Love this photo! I write because I am a writer. Writing is what I do. For me, writing is like breathing. I’ve been doing it seriously since I was a teenager reciting dreadful poetry about romantic rejection on the bus after school. Indeed, since I was 11 years old and Mum taught me how to spell enthusiastic and gave me my Roget’s Thesaurus. I knew, even way back then, that I wanted to be a writer! I knew who I was. Writing in my journal while waiting to see my rheumatologist. What are the results going to be? Jan 2014. However, pursuing that further, why is writing like breathing for me when for someone else, it’s more like a heart attack and they’d struggle to write more than a paragraph in a life time? What determines that distinction? What makes me write and write and write. Indeed, to keep writing long after my physical body has all but fallen asleep just to get the story out? Yet, that someone else can live quite happily without ever writing a word. Foot Writer- all pose, of course! But out of where? My head? My heart? My soul? Moreover, is it even my story to tell or does it belong to the muse? God? Where are all these ideas coming from? Isn’t that one of our eternal conundrums and part of the writer’s quest? !! Writing in my journal at Palm Beach yesterday. 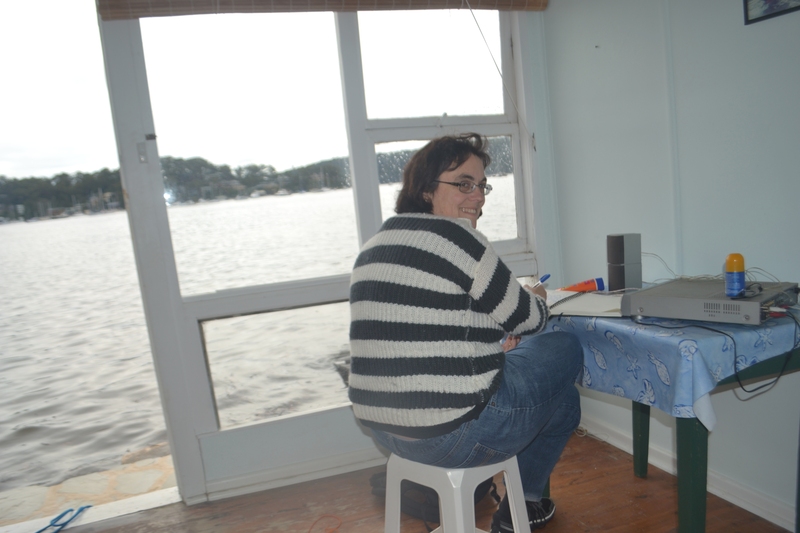 I was so focused on the view I didn’t even notice the DVD player on the table. I was in the zone. Moving on a little further, is there a distinction between someone who writes privately for themselves and those writers who see writing is as a vocation and for them, if they don’t publish, they shall surely perish? Personally, I do believe that writing with a view to publication is a different ball game and I guess this is why I am getting to with this title. Why jump through hoops and push yourself beyond survival in the same way a marathon runner pushes their mind, body and spirit beyond breaking point with the faith (or is it simply hope) of reaching the finish line. For writers, financial security is usually a pipe dream and we somehow survive on thin air and relationships with our nearest and dearest can become severely strained as our focus fixates on the laptop, word count and the intricacies of fictional characters instead of those we say we love. After all, writing usually demands silence or at least a sense of peace and that really doesn’t sit well with physical human interaction. This has been W for Why Write for the Blogging A-Z April Challenge. This entry was posted in Blogging From A-Z April Challenge, Poetry and tagged A-Z Challenge, acceptance, blogging, Elizabeth Gilbert, George Orwell, literature, muse, poetry, Why I write, writer, writing on April 27, 2015 by Rowena.